Fall is officially here and I’d like to share one of my favorite braising recipes, Osso Buco Milanese. These braised veal shanks are tender, moist and flavorful. What makes them “Milanese” is the parsley, lemon zest and garlic topping, called gremolata. 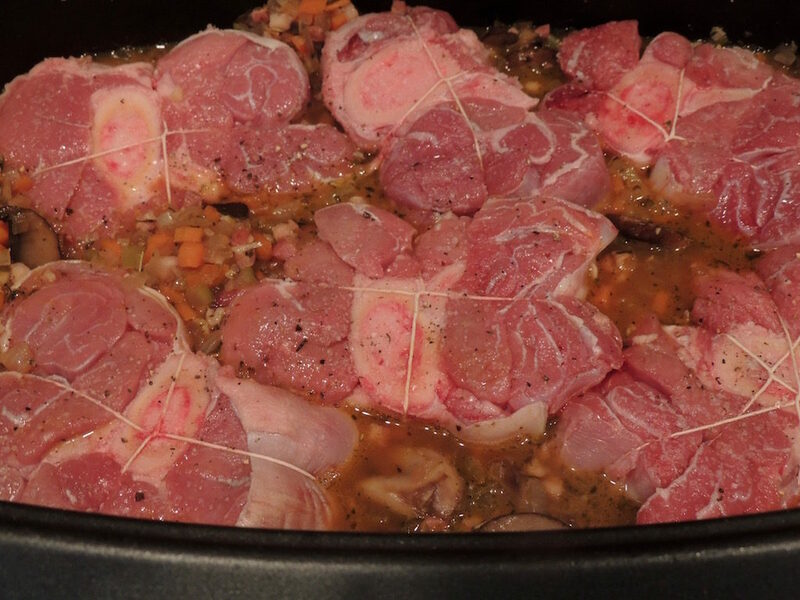 To make Osso Buco Milanese use either the stovetop or a slow cooker. I have a slow cooker with an insert that goes from stovetop to slow cooker, saving me an extra pan to wash.
Bring to a boil, lower the heat to a gentle simmer, just an occasional bubble or two; the ideal temperature is 180 degrees F. Cover and cook for 3 hours or until fork tender. Be sure to check occasionally that the braise is not boiling. If so, lower the temperature or use a heat diffuser. Place prepared ingredients in slow cooker base, cover and set to low and cook for 6 hours or until fork tender. You’ll notice the difference in cooking times with different appliances. The stovetop is harder to control and cooks at a slightly higher temperature than a slow cooker. You should check the braise periodically to make sure the simmer is under control. If you don’t have a low pilot light for braising or stewing, consider getting a heat diffuser, which lifts the pan further from the flame. The oven is an option, but I find that it cooks at temperature that is almost impossible to maintain a gentle simmer. The higher heat cooks the meat too fast making it tougher and drier that the other two methods. This is a white braise, no need to brown the meat, and uses a dry white wine. I often substitute a dry rosé instead of the white wine, as I frequently (always) have an open bottle on hand. 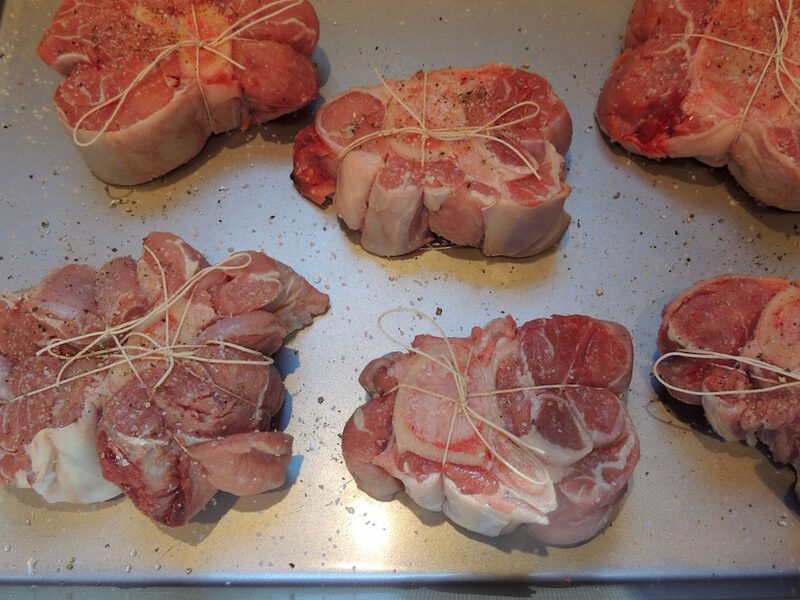 Place the shanks on a sheet pan and secure the meat to the bone with butcher’s twine. I like to tie the shanks like a present, top to bottom, instead of around the middle. The meat shrinks and the tie around the middle doesn’t hold them to the bone as well. If you have a large shank, you may want to tie again in a different direction as shown below. To season the meat and keep the salt and pepper from strewing around your kitchen counter, place the baking sheet in the sink and sprinkle the salt and pepper from above. 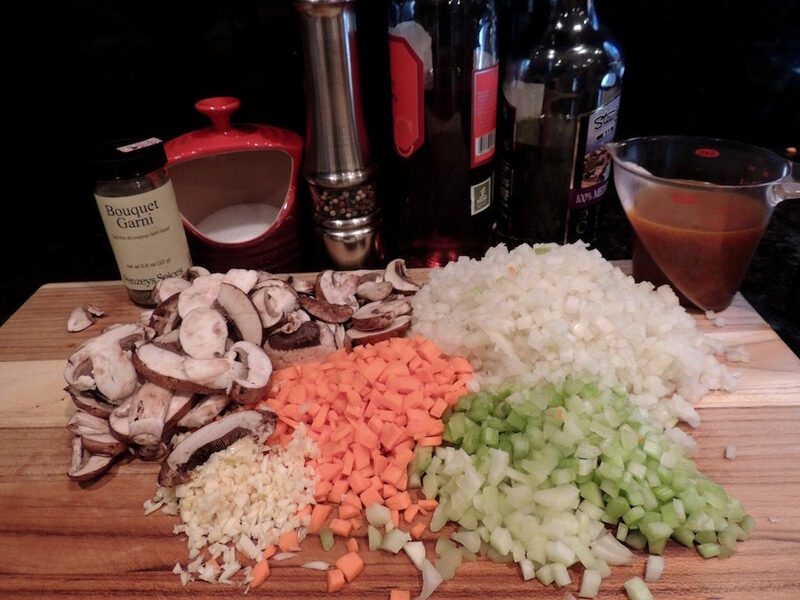 The traditional mirepoix, onions, celery and carrots is a must for almost any braise. We’ve added diced pancetta for a richer sauce. Use a traditional bouquet garni, a couple of parsley stems and thyme twigs, a bay leaf or two and a few peppercorns wrapped in cheesecloth. I like to use a Bouquet Garni herb blend from Penzeys. It doesn’t have to be removed and adds great flavor. The blend contains savory, rosemary, thyme, Turkish oregano, basil, dill weed, marjoram, sage and tarragon. If at all possible, make any braise or stew a day before to allow the flavors to meld overnight. 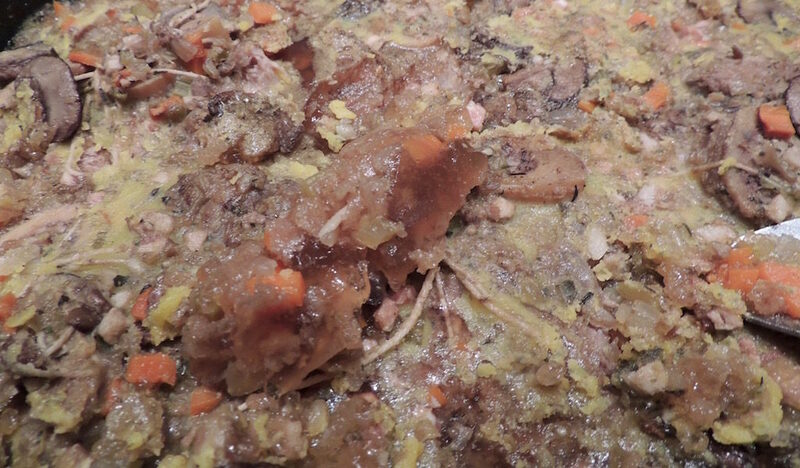 Notice how the sauce gelled over night – all the gelatin from the bones makes for a very rich sauce. The fat rises to the top and hardens for easy removal. I know the liquid seems minimal, maybe even sparse, but the vegetables and meat expel juices creating more liquid, which keeps the flavor of the sauce intense. Simply tuck the shanks into the braising liquid, cover and cook. Serve this delicious Ratatouille as a side to the Osso Buco Milanese! Osso buco milanese is a rustic dish of braised veal shanks in a rich sauce served with gremolata, chopped parsley, lemon peel and garlic. 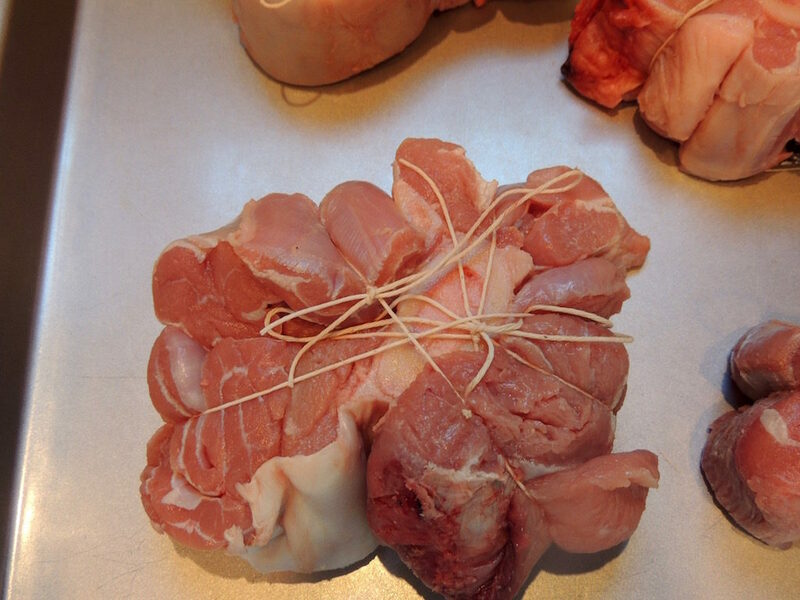 Tie the veal chops with butcher twine and season both sides with salt and pepper. Heat the oil in a 7-quart Dutch oven over medium-high heat. Put the mushrooms in the hot pan in a single layer and sear, stirring once after 2 minutes. 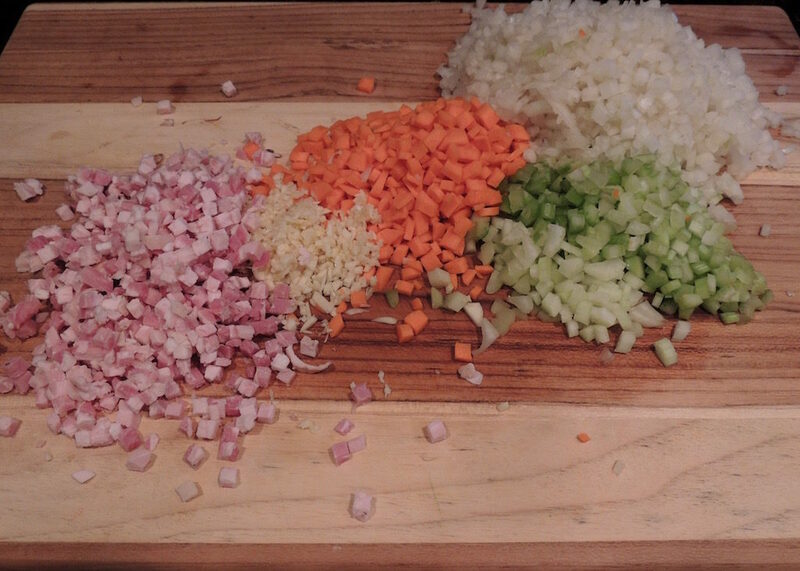 Add the pancetta, onion, carrots, celery, garlic and salt; sweat for 6 minutes, stirring occasionally. Add the herbs and stir for 15 seconds. Note: You can use a tradition bouquet garni (a couple of parsley stems and thyme twigs, a bay leaf or two and a few peppercorns wrapped in cheesecloth). I like to use a Bouquet Garni Herb Blend from Penzey’s. It doesn’t have to be removed and adds great flavor. The blend contains savory, rosemary, thyme, Turkish oregano, basil, dill weed, marjoram, sage and tarragon. Stir in the stock and tuck the veal shanks into the vegetables. Bring to a boil, lower the heat to a gentle simmer, just an occasional bubble or two. Cover and cook for 3 hours or until fork tender. Be sure to check that the braise is not boiling occasionally. If so, lower the temperature or use a heat diffuser. Bring to a boil, cover and set the slow cooker to low and cook for 6 hours or until fork tender. Remove the veal shanks to a warm platter. You have two choices with the sauce: Rustic – keep the sauce in its natural state, or Refined – puree the sauce. Pour a little sauce over the veal and serve the remainder on the side. Strew the gremolata over the shanks and serve. 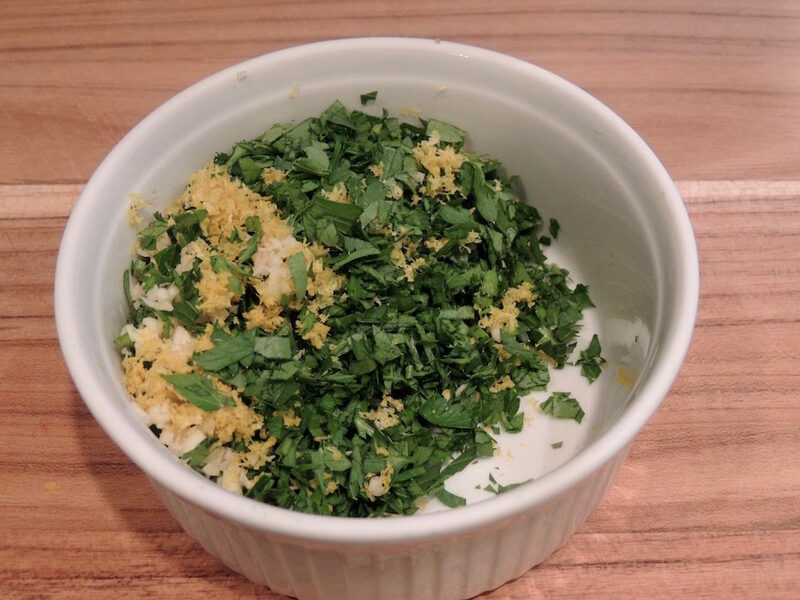 Combine the parsley, lemon, garlic and salt in a small bowl. Make a day ahead to let the flavors meld.